At the Tuwanek Hotel Luxury B&B we are pleased to provide guests staying in the “Hotel Suites” with a common “Club Room” where you can enjoy some quiet time with your favourite book by the wood burning fireplace. Enjoy a Movie in the Theatre and Sound Room which has been custom designed to provide you with the best in Digital Theatre Experience, or have fun in the Games Room with pool, slots and board games. Don’t forget the oceanfront decks, beach and BBQ area as well as a small fire pit for evening camp fires and marshmallows while you gaze at the stars. The Club Room is open each day from 11 am to 11pm. At the Tuwanek Hotel Luxury B&B we are pleased to provide guests staying in the “Hotel Suites” with a Movie Theatre. Cottages are provided with their own private Flat Screens with Apple TV and Netflix. Enjoy a movie or concert in the Movie Theatre and Sound room with Apple TV, Netflix and over 300 titles your choosing, add popcorn and you are set. Enjoy! Games Room with Pool Table. Enjoy the comfy club chairs and wood burning fireplace. Fun Slots and Board Games. 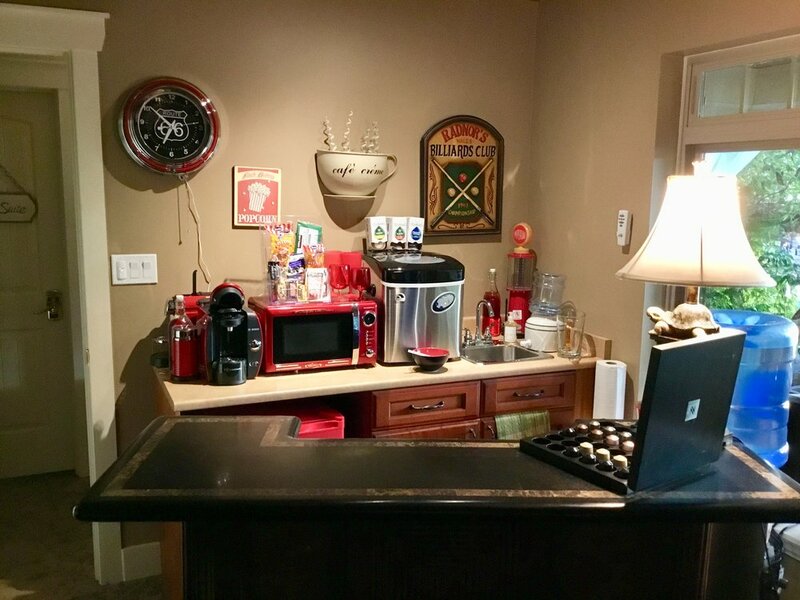 The Snack Bar comes complete with wet bar area with glasses and cutlery, ice maker and a wide variety of snacks and soft drinks. All you need to do is bring your favorite beverage! We are please to launch our new complimentary Nespresso Espresso bar for your enjoyment. Lounge in the Club room, play a game of chess with your favorite beverage.